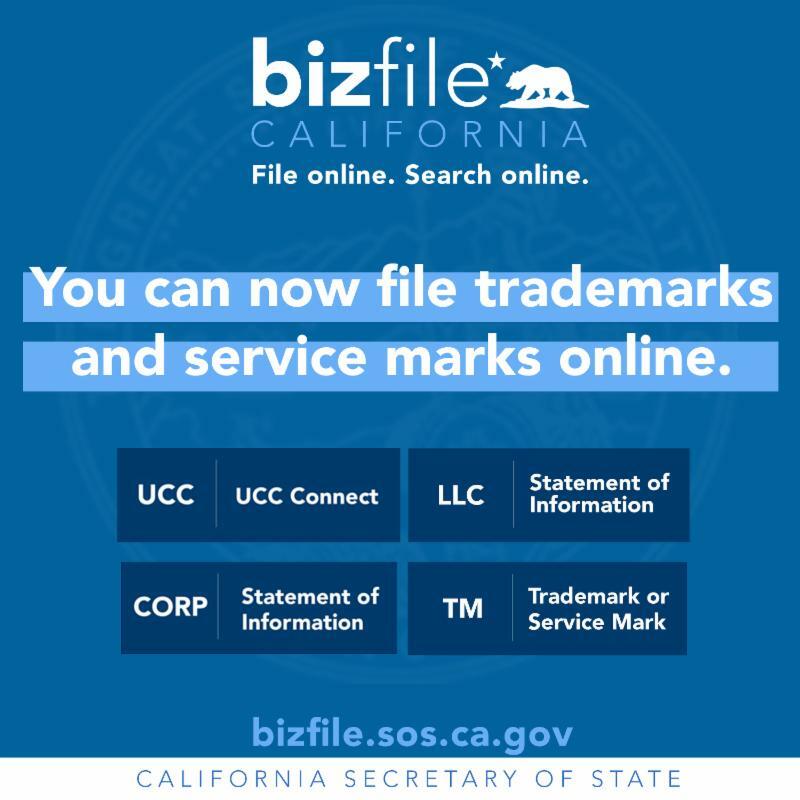 Secretary of State Alex Padilla announced that for the first time, Californians can file trademark and service mark applications for registration online through bizfile California, the agency’s online business filing and search portal. “By offering our trademark and service mark application process online we’re making it quicker, easier and more convenient to do business in California,” said Secretary of State Alex Padilla. “Previously, business owners could only submit their applications by mail or in-person. Now, they can submit trademark or service mark applications in minutes from the convenience of their laptop, tablet or smartphone." The new trademark and service mark platform was designed and implemented in an unprecedented seven week period in collaboration with the Secretary of State’s office, the California Department of Technology and the ThinkSmart LLC Platform. The online trademark and service mark platform is part of Secretary Padilla’s Digital Business Initiative to modernize and digitize the agency’s divisions, including the Business Programs Division. In 2017, The Secretary’s Digital Business Initiative was recognized by the Governor’s office of Business and Economic Development (GO-Biz) as a champion for “Breaking Barriers to Doing Business in California.” The Digital Business Initiative includes an online LLC and Corporation Statement of Information filing tool, 11 million searchable business records through California Business Search, an updated search engine for the state’s successor-in-interest claims, and a Starting a New Business resource page. 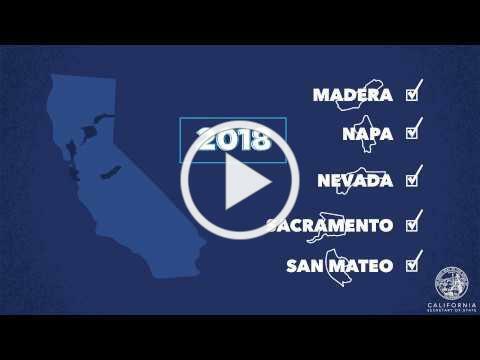 Big improvements are coming to elections in the counties of Madera, Napa, Nevada, Sacramento, and San Mateo in 2018 thanks to the California Voter's Choice Act . 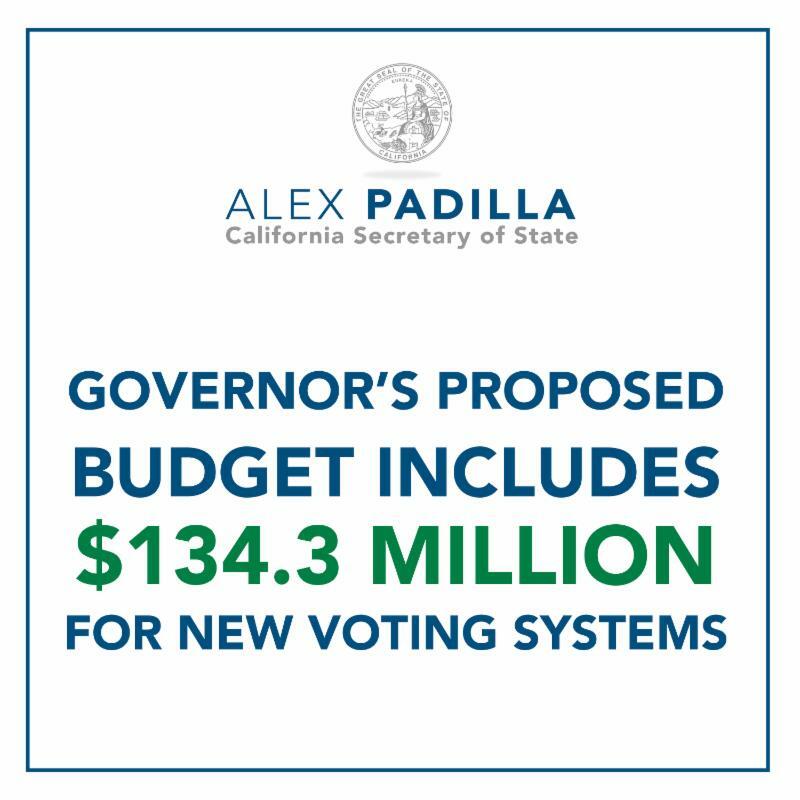 To help prepare voters for these improvements, Secretary of State Alex Padilla released a new public service announcement as part of a comprehensive public education campaign. “In counties implementing the Voter’s Choice Act, voters will now have more options for when, where, and how they cast a ballot,” Secretary of State Alex Padilla said. “We want voters to be informed about expanded early voting opportunities, secure ballot drop-boxes available throughout the county, and full service vote centers for those who prefer to vote in person or who need assistance. 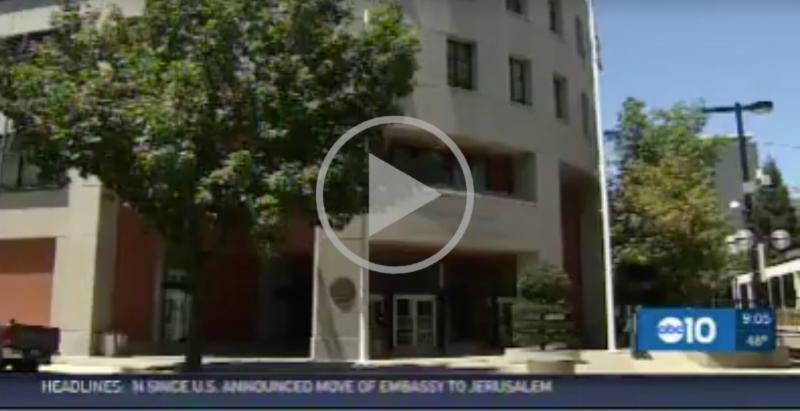 This new video will help voters take advantage of these exciting new improvements." In December, Secretary of State Alex Padilla unveiled a Voter's Choice Act website: voterschoice.sos.ca.gov. The new website has useful information about the Voter’s Choice Act, a calendar of key dates, and a tool kit for stakeholders and voters interested in learning more. The Secretary of State will partner with county registrars and community organizations in participating counties to inform voters about the election improvements. 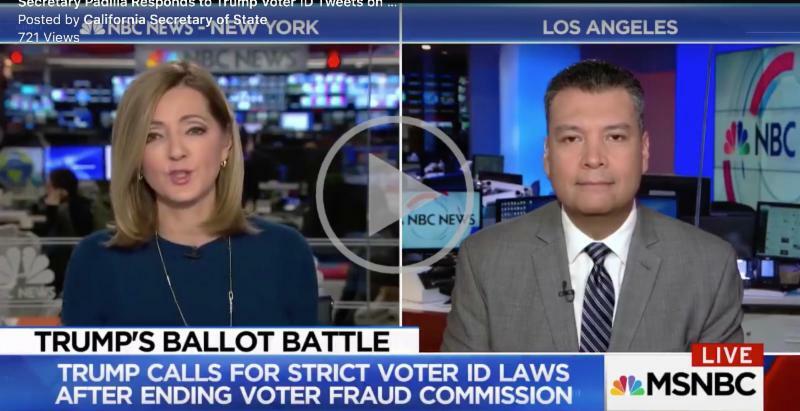 “It is no surprise that a commission founded on a lie of widespread voter fraud proved to be a fraud itself," said Secretary Padilla. " After the inevitable failure of his voter fraud commission, Trump is doubling down on his voter suppression crusade by calling for oppressive and discriminatory voter ID laws. The President’s support for voter ID laws is simply unconscionable. Voter ID laws disenfranchise American citizens, including the elderly, young, poor, and persons of color, who are less likely to have a government issued ID and are therefore prevented from casting a ballot. The president should address Russian interference in our elections rather than creating roadblocks for Americans to vote." Thanks to the hard work and dedication of our entire agency staff, 2017 was another milestone year at the California Secretary of State's office. Whether it was pre-registering more than 70,000 California youth to vote, helping more than 185,000 business owners file their annual LLC Statements of Information online, launching six new digital archive exhibits, or revamping our Safe at Home website, we have so much to be proud of. 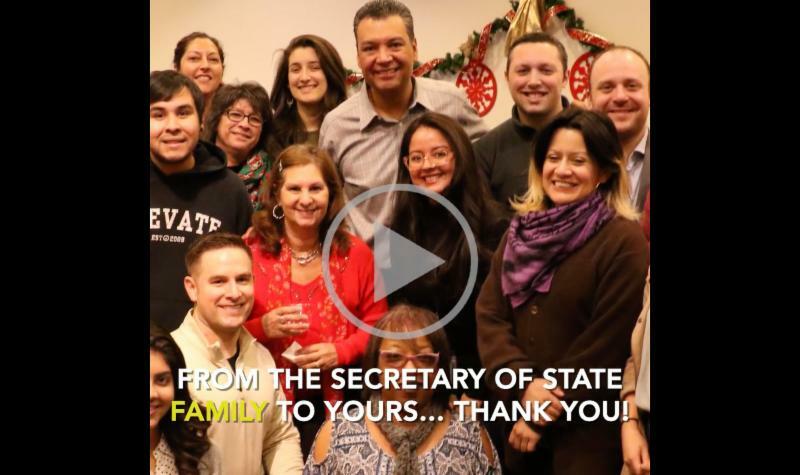 Happy New Year from the California Secretary of State! The California State Archives has completed one of its largest digitization projects ever with the William M. McCarthy Photograph Collection . The collection features nearly 3,000 photographs taken by native Californians William M. and Grace McCarthy from approximately 1905 to 1938. The McCarthys traveled extensively during the early years of automobile travel, as newly constructed highways connected people and places throughout the United States and beyond, providing pictorial documentation of a pivotal period in our nation's history. Click here to view the McCarthy Photo Collection. Secretary of State Alex Padilla released a statement in response to reports that the U.S. Department of Justice is requesting to add a question about citizenship status on the 2020 Census. March Fong Eu, a trailblazer in California politics, passed away on December 21st, 2017, leaving behind an impressive and lengthy record of achievement and excellence. Through her four terms as an Assemblywoman from the Oakland Bay area and 19 year tenure as California Secretary of State, Eu was a dedicated public servant to the people of California. March Fong Eu broke ground as the first woman elected to the California Secretary of State office and the first person of Chinese ancestry to be elected to statewide office in the United States. 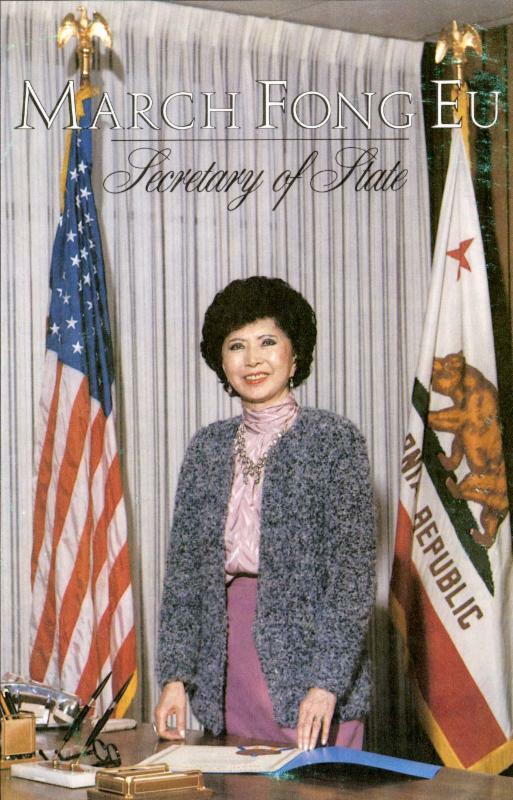 During her time as an elected official, Eu was able to ban public pay toilets, institute voter registration by mail, reduce deadlines for voter registration, streamline the business filings process for corporations, enforce notary public laws and protections, and successfully build the Secretary of State complex that houses both the California State Archives and California Museum. Secretary of State Alex Padilla has called for the renaming of the Secretary of State complex in Honor of March Fong Eu, stating, "Secretary of State March Fong Eu's decades of public service reflects the office of the Secretary of State at its best -- a commitment to transparency, access, inclusion, respect for history, and progress." We honor Secretary of State March Fong Eu's legacy, and send our thoughts and prayers to her family. June 5, 2018 Primary Election is 139 Days Away! The June 5, 2018 Statewide Direct Primary Election is 139 days away! Need to register to vote? Want to check your voter registration status? We can help. Visit RegistertoVote.ca.gov to register or pre-register to vote today. Visit VoterStatus.sos.ca.gov to check your voter status.